I own the Reliant Kore, specifically to zip around the galaxy doing small cargo runs solo or with a younger family member. If I didn’t already have the Drake Herald, I might have opted for the Mako news van variant instead. The Reliant Kore considered the base ship in this series, is an introductory cargo hauling vessel. However, unlike the smaller hauler in the MISC Hull series, the Reliant also equipped with moderate offensive and defensive capabilities. It also supports two crew stations, which is rare at this price point. Compared to other introductory cargo ships, the Reliant Kore at $50 USD, 30 cargo units of space and combination of S1 and S3 hard points, make it a good value against its competitors. The Aurora CL which is a mercantile ship costs $45 USD, holds fewer cargo units with its 23 and is also moderately equipped for combat with S2 hardpoints. The MISC Hull A transports 48 cargo units, is equipped exclusively with S1 hardpoints but costs $60 USD. So depending on your intent and playstyle, the Reliant Kore can be a very good fit. If your intent is similar to mine, opportunistic small-scale cargo hauling with a friend or family member, only the Reliant will fit that bill. If you’re a dedicated hauler and this will be your primary method for earning money in the game, the single seat Hull A is a better value because of it’s larger cargo hold. If you want to transport cargo AND do combat missions right from the start, the Aurora CL is likely a better choice. Outside of combat, I want to share my experiences with others, which makes having multiple crew stations a priority, hence I opted for the Reliant Kore. 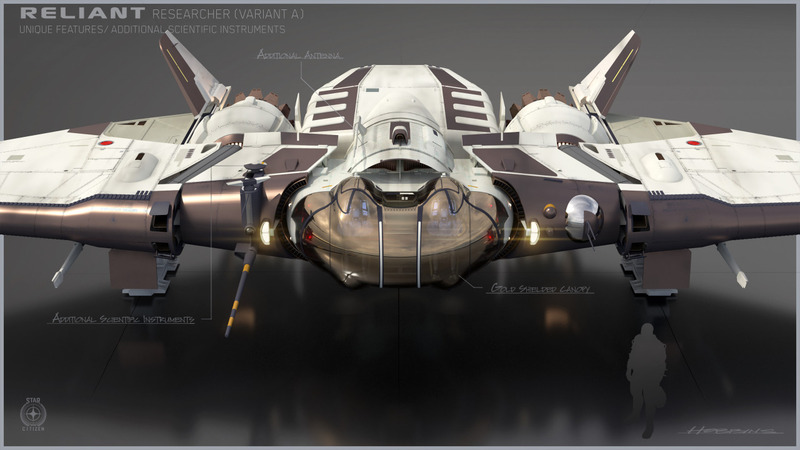 The Reliant Sen is starter ship focused on exploration with advanced sensor capabilities. It’s not clear to me what calling it a “mobile science platform” means, as we’ve yet to see the science profession design document. But I would assume it will support components that allow the Sen to perform some of the less intensive tasks from the science career. if you’re in the market for a starter exploration ship, the Reliant Sen price and hardpoints configuration, pit it against the Aurora ES. Here again, for someone wanting a dedicated exploration vessel that is the primary method for initially earning money in the game, the ES is a good value. However, with 10 cargo units of space, exploration equipped, mobile science capabilities, decent combat abilities and two crew stations, I think the Reliant Sen is the better overall value. Are you an information hound? Do you want to capture what’s happening in the verse and relay events as they unfold, to civilians and citizens alike? Then a career in news and entertainment, alongside being the owner of a Reliant Mako, might be for you. The Reliant Mako utilizes a state of the art Image Enhancement suite and turret-mounted optics, to capture every moment as it happens, allowing you to deliver the clarity and accuracy needed to make headlines. It’s a baby Herald of sorts, letting you do recon and information relay. Owners will be able to obtain the best picture and footage from the safest distance possible and spread the word. It’s scanning and broadcast capabilities won’t be as powerful as a Herald, being a starter ship, but it will get the job done. And like the Herald, it supports two crew stations. Pew-pew incoming… What would a series of starter ships be without a combat option? The Reliant Tana enters the ring as the only two-person combat ship, classified as a starter vessel. Categorized as a lightweight fighter, it brings with it high custom high-yield power plant and stronger shields due to its Xi’an technology. It possesses additional weapon mounts AND a wider coverage arc owed to its design. Entering the game as a static duo? Want to bring someone along who’s not adept enough to fly their own combat ship? Planning to take off with one of your children? I think the Tana is an excellent choice. Here are other factors to consider about the Reliant Series in general, that I’ve gleaned from the Concept Sale Q&A Posts. CIG considers the Reliant a utility ship. It was designed as a starter that provides multiple player profession opportunities in a single ship series and is more persistent universe game-play focused. The secondary station is to control turrets. When flying solo, you can slave the turrets to the pilot. However, you’ll lose the benefit of the ship’s unique large coverage arc. This impacts combat, scanning, and news-reporter related activities. It is strongly suggested the ship be manned by two players. The two flight orientation modes each have their own benefits. Vertical is a better profile for combat, as it adds increased maneuverability and better spread of the thrusters. When locked in the vertical position, the pilot seat is on top. Horizontal is less agile but has a higher top speed. It should also be noted that transition between the two orientations will take a few seconds and isn’t something we should expect to do quickly, while engaged in combat. Additionally, players can only exit their seats while in the horizontal orientation. Definitive plans about including jump drives as default configuration in the variants haven’t been determined. They will, however, all be capable of having one installed. The Tractor Beam mounted on the Wing-Tip can be replaced with size 2 weapon. This would be useful for flying the ships in Arena Commander or in circumstances where combat is highly anticipated. Note that the Tractor Beam isn’t a default component in the base variant, the Reliant Kore. The planned speed for the Reliant will fall between Aurora’s 150 MS and the Mustang’s 200. From the Q&A response, it’s not clear if that includes the increased speed received from being in the horizontal orientation. While each ship in the series will support component flexibility, within the variants themselves, not all components are interchangeable. It’s not a simple matter of taking a component out of the Mako and putting in the Kore. The Kore and Tana are kindred and can cross change components. As are the Sen wit the Mako. That’s a run down of the information available for the MISC Reliant series. I hope it’s been helpful to anyone considering a pledge for it. It’s likely to go on sale when 2.4 hits the Live Server.